G’day! Welcome to Partake and the last in our series “Scriptural Delights!” As a way of concluding, let us take a look at what some people have said about this Psalm. We are going to engage with the minds of Augustine, John Calvin, Charles Spurgeon and CS Lewis: and they will give us some insight into this magnificent Psalm. A friend of mine, Sharona, commented to me about Psalm 119! This is her memory of the great Psalm! Years ago, I gave my boss a Bible. He had been telling me that he had never owned anything but a KJV and didn’t understand it at all. I gave him a hardback NIV pew Bible. He put it in his desk drawer but never looked at it. One day I went into his office to find him shuffling through the pages of the Bible, clearly looking for something. I asked if I could help and he told me he had been watching a football game and someone held up a sign that said “John 3:16” so he was trying to find out what it said. I helped him find the verse. Then he closed the Bible, opened it at random and read aloud, “Your word is a lamp to my feet and a light for my path” and I said “Psalm 119:105 !”. He looked at me in shock, and with sheer admiration in his voice said, “Oh, you’re good!”. Then he closed the Bible, opened it at random and said “Let’s try again!”. Then he read a verse I had no idea where it came from, but it sounded a bit like it could have been Isaiah. I said tentatively, “Isaiah?”. He said, “No, think bullfrog…” And I said “Oh, Jeremiah!” and we both had a laugh about that. OK, it’s random, but I have a laugh about that every time I think of that happening, him thinking I was such a brilliant biblical scholar, because I knew a verse from Psalm 119. Thanks for that, Sharona – terrific story! So lets sum up what each of these witnesses for Psalm 119 offer us in the 21st century. For Augustine, the Psalm is like a staircase for ascending to a fixed place where God reigns! For Calvin, the Psalm encourages followers of God to follow godliness, live and study diligently what God has revealed. He also notes how the Psalmist frequently blends promises in order to animate worshippers of God to live more justly and humbly. For Spurgeon, It is portrays a sacred unity, whereby prayers, testimony and praise intermingle, intermix and form a sweet incense! Psalm 119’s prayers bear testimony, and its testimonies are fragrant with praise. For CS Lewis it was like an intricate embroidery, patterned, cunningly weaved and a labour of love for Almighty God and His Law. What is it for you? Have you considered scripture as being like an elaborately intricate staircase to ascend, so that you can get to know your God more, in order to live a life worthy of him as your prayers bear testimony and your testimonies of God’s goodness bear the fruit of praise? Hopefully as we are now at the end of these series of studies, you will have found a new delight in reading your Bible: all 66 books of it including perhaps some that you have never read before. Ask yourself how you view the Bible, how you read it, why you read it and do you listen to God speaking to you as you do so? Has your attitude and feelings changed towards the Bible as a whole? Do certain parts of the Bible now captivate you more than they did before? G’day! Welcome to Partake and our continuing series “Scriptural Delights!” Here is our twenty fourth podcast going through the wonder that is Psalm 119! Today we look at the twenty second of its twenty-two sections, Taw, and it is verses 169 to 176. Sharona is reading it for us today! Thanks Sharona! Once again, in verse 169, David the Psalmist repeats his inner desire to understand God’s word, law, decrees, statutes and wisdom! He is full of zeal for God and is earnestly yearning His God to reveal His promised wisdom and understanding to him. The Psalmist is in a relationship with God and seeks to get to know His God better and God has promised him that He will pass on wisdom to David through the law and the scriptures. God will enlighten His servant, the Psalmist, because He has promised to, and He who has promised is faithful to honour those promises. The Psalmist greatest desire is to understand the mind of God, developing his relationship with Him and to be guided by Him! The Psalmist desires that every facet of his life be guided by his great all-knowing and all-powerful God! Part of this guidance, is the Psalmist praying to God in verse 170, making requests and seeking deliverance from the dangers and perils of his life! David, as we read in the Bible, often faced great dangers throughout his life. His God always delivered him from evil, because God honours his promises to those who are serving Him. And now in verse 171, he is overflowing with praise! He is effervescent with praise, overflowing, bubbling over and ecstatic with joy for His God! The reason for this exuberance is that he wants to be imbued with heavenly wisdom as taught through the decrees and statutes of Almighty God! It gives the sense of a spontaneous outburst of praise just exploding from the Psalmist like spring water bubbling from the desert sands! Having been taught by the Lord in the practise of righteous obedience to the Law, the Psalmist is intent on teaching others! He is passing on to others, the wisdom he has learned and received! The sense here is of corporate singing of exultant choral praises of God or an echo of the angels singing of God’s awesome majesty, beauty and holiness! Continuing, the Psalmist entreats God to personally help – nor my friends or your friends, O God – but you and you alone! Give me your hand O Lord and I will be rescued! Friends may let me down, discourage and betray me – but you O great God will never do that! Personally save me, the Psalmist is crying! By choosing God’s precepts, the Psalmist has dedicated himself to obeying his God and following Him closely. The Psalmist was keen to be found in full obedience to his God. And he yearned for full salvation from his God – he had tasted it in part before but was waiting for it to be complete, as if in expectation of some form of greater salvation. He had been saved from his enemies, those who betrayed him and from wild animals. His present salvation was assured as God had promised him, but so was a future salvation, a salvation of his soul! Hence, there is his longing to delight in all of God’s words and works. This future salvation of the soul, filled with life, preserved so he may praise God! God’s judgments sustained and helped the Psalmist! Seeing God at work in his life gave him a hope – a hope that promised a future praising God for all God has done, is doing and will continue to do! God’s judgement helped the Psalmist to live an obedient life and a life that was close to God, walking and talking with Him! Then finally, we have the climax of the Psalm! There is almost an urgent need to be fulfilled. The lost sheep needs to be found, to be preserved and to be delivered. For all his knowledge of Scripture, his obedience to God and his own righteousness – the Psalmist knew that it was only because God had promised to find him that he would be saved. He was relying on God to assure him of the salvation of his soul. As a shepherd, he knew that if a sheep was lost, it was his job to find that sheep and restore it to the fold. So he uses this analogy, to symbolise his need of God’s salvation. His own righteousness and obedience to the Law couldn’t save his soul – only God could do that. God would seek him, find him and restore him. Here was the king, King David, recognizes his need to be a servant of God and wanting God to find him. He recognizes he needs to be obedient to God in response to being saved by God’s grace and mercy. How about you? How are you doing in regards to your praise? Is praise bubbling from you like water from a living stream? Are you being fully reliant on God alone for the salvation of your soul and not trusting in your own righteousness, obedience or strength? God’s grace and that alone is what saves you. Not God’s love. Not God’s mercy. But God’s grace and that grace alone. What is your delight, your ultimate delight? Your delight should be in being guided by God in every facet of your life and being in a devoted obedient relationship with Him. Ask Him and he will help. Raise your hand and ask for help, just as Peter did when sinking in the water and Jesus rescued him. In response to this grace and the salvation that is yours assured, go and live a life of obedience to God – wherever that takes you as His servant. G’day! Welcome to Partake and our continuing series “Scriptural Delights!” Here is our twenty second podcast going through the wonder that is Psalm 119! Today we look at the twentieth of its twenty-two letters, Resh, and its verses 153 to 160. Sharona reads it for us! preserve my life, O LORD, according to your love. Thanks Sharona, that was great! Once again the Psalmist is in danger of losing his life! He is seeking to be delivered from his pains and rescued! He is one of God’s servants and seeks to show that by remembering God’s law, God’s words and behaving as one of God’s servants, devoted in fear, reverence and love of Almighty God! And because he hasn’t forgotten God’s law, he pleads for God to consider and remember him. He is not so distracted by his own problems, that he has forgotten the beauty of God and God’s Law! He is faithful to God, because he knows that God is faithful to him! His persecutors are surrounding him, circling with menace so the Psalmist asks for his God to be his advocate, his redeemer! The Psalmists enemies are spouting lies, ensnaring, oppressing and committing perjury against him, so he calls for his advocate and defender! He also asks that his Almighty God preserve him according to God’s own promise. He knows that God always fulfils his promises to those who follow him. The promises of God are as a soft healing balm to the frustrations and wounds of the Psalmist. And while the Psalmist has a hope in his God, those who persecute, oppress and endanger him are bound for destruction! These wicked oppressors can never find salvation because they are removed from God, ignore God’s decrees and commit blasphemous acts in defiance of God’s decrees! The Psalmists persecutors are only interested in their own wisdom instead of seeking the wisdom of God. In contrast to these wicked people, the Psalmist has not strayed from God’s righteous statutes! He knows Almighty God is compassionate, a great help in times of trouble and preserver of life – nothing can happen to the Psalmist unless God allows it, and God wont do that because of His tremendous promises found in His Law. The mercies of the Lord endure forever and ever – they are innumerable, immeasurable, immense, tender and true. When he sees the wicked persecuting oppressors disavowing God, actively being wicked in disobedience, the Psalmist is full of righteous indignation and loathing! In contrast to the unrighteous who are against him, is the Psalmist who loves God’s precepts, commands and Law. He knows that the Lord’s anger is slow to burn and that the Lord is quick to love those who actively follow him. All of God’s words are true, all of God’s laws are righteous, exclaims the Psalmist! All of them from beginning to end and from top to bottom! This was a man willing to stand up for God with zeal, passion and righteous indignation – even if it cost him his very life! How are you doing in your appreciation for what God has done for you? How are you doing when the world around through the media or people you know, seek to discredit your Christian belief in Almighty God? Are you sometimes filled with zealous indignation when Christians and Christianity are perjured against in the media or your workplace? Who is your advocate before God that defends you, wants to redeem you, deliver you from your enemies and those who would seek to bring you down and cause you to lose heart? As Christians, Jesus Christ is our advocate before God the Father. Do you know the promises of God, which can be found in the Bible? Read the Bible and when praying, have your Bible open and tell God what you are reading! All of Scripture, the Old Testament and the New Testament, is reliable and true- from beginning to end – just as the Psalmist exclaims for the portion that he had at the time. In doing so, you develop an intimacy with God the Father, through God the Son in the power of God the Holy Spirit who lives inside you! This engenders a love for all of the Bible and not just your favourite parts! Be prepared to worship God in all manner of styles and not just your favourite style. Yet sometimes we have those in the church who like to discourage, perjure and hyper-criticize. No need to go far to find other Christians perjuring and espousing misleading words against us – particularly in the area of worship! Too many Christians today are perjuring others, being one-dimensional in their acts of church worship, short in their bible reading and are living stunted Christian lives because of it. Just because another person experiences the Holy Spirit in a way different to you, doesn’t invalidate that way, but rather reflects the unique way God the Holy Spirit is working in the life of that person! Rejoice when that other person is worshipping Almighty God, even if the style of worship is not your own particular choice! Don’t restrict the Holy Spirit’s activity in your own life and do not grieve Him by trying to restrict and criticise His activity in another Christian’s life – to do is blasphemous and to call unclean that which is clean! Go and rejoice in the freedom of the Gospel for all people to worship in Spirit and truth and in many different styles – reflecting the manifold mercies of an ever-gracious God! A God who is gracious to save and merciful to be worshipped and adored! A jealous God worthy of zealous followers! G’day! Welcome to Partake and our continuing series “Scriptural Delights!” We should have been looking at the eighteenth letter Tsadhe (ts-th) but Jim Harris is unable to do that for a couple of days. Here is our twenty first podcast going through the wonder that is Psalm 119! Today we look at the nineteenth of its twenty-two letters, Qoph, and its verses 145 to 152. Sharona reads it for us! preserve my life, O LORD, according to your laws. Thanks for the reading, Sharona – that was great! Here the Psalmist starts this section with two impassioned calls or loud cries! These are not necessarily loud audible cries but rather the inner desires of the heart and a bending of the will calling out to God. The first time is for God to hear him! His whole begin – body, mind and soul – are crying out go God, pleading with Him with full mental, emotional and spiritual energy. These are impassioned pleas. And the Psalmists knows that God will hear him, particularly if he is listening out for the Lord to speak, hence the being obedient to the decrees of Almighty God! Our Psalmist, David, is determined to live a life that is pleasing to God. To life a life that is worthy of being called God’s servant. Not only was it impassioned prayer, but also it was prayer borne out of determination. He knows his need to be rescued, so he cries out to the one who can save him – Almighty God. As a result of being saved by God, the Psalmist pledges to be obedient to God the rescuer. The Psalmist promises to follow God’s instructions and statutes in full obedience. Now for the third time, the Psalmist mentions that he has cried, pleaded, begged passionately for God. The Psalmist’s prayers are frequent, intense and strong. So strong are his desires are that the moment he awakes, he is in prayer. A key element of his prayers is hope. Here the Psalmist David has put his hope in God and God’s word. God is faithful, as the Psalmist has said throughout, and God’s words are also faithful and true – they can be relied upon to encourage and give hope. So intense is his prayer life, that not only is he up early in the morning, but late at night he can be found to be mediating on the promises that God has made! The Psalmist’s prayers were all day long! From before dawn till after dusk! He prayed to and worshipped His God all day and with great fervour and eagerness! He knows God will hear his voice, his pleadings as he maintains an attitude of hope, worship and adoration. And to reaffirm that, he knows that God is a great God of love and a God of great love! Here in verse 149, it’s an audible prayer, not through any merit of his own, but of the merits of God! This God is loving, kind and preserver! This God fulfils the promises He makes! He gives strength in order to overcome the burdens faced by the Psalmist! When the Psalmist is faced with death, the God he serves, gives more life! WOW! The Psalmist doesn’t concentrate on himself or his own voice, but rather on this God and His voice, particularly His voice as seen in the laws. He will be rescued before his enemies can kill him. These wicked people are the opposite of the Psalmist. Where the Psalmist is close to God, listening to God with open obedience and hoping in God’s promises, the scheming enemies are far away from God, from God’s laws even though they are near to the Psalmist. His enemies are only after mischief and troublemaking, not for the things of God! Yet as near as his enemies are, the Psalmist knows that God is even closer! His God is watching over him, to preserve, love and watch over. God’s commandments are true, worthy of obedience and trustworthy. God is near, He is true and the Psalmist is safe. This loving and living God sees His servants under oppression and burdened and draws even closer to them to give them aid, assistance, comfort and encouragement. No wonder the Psalmist is keen to be obedient to his Worthy God! In verse 152, we get the idea that the Psalmist, David, is now an old man when writing this. Long ago in his youth, he learnt God’s word and the stories, commandments, testimonies of God and those who followed God. The Psalmist built upon this rock, this established base and is seeking earnestly to live a life of utter obedience to this living God – a living God who does not and cannot change! WOW!! This is an encouragement to us! How is our prayer life? Is it only on Sundays during church that we seek to connect with God? This God we pray to, seek to worship and obey, is worthy of our attention all day, every day! Are you burdened with something and feeling weighed down? Then ask and implore your God to take your burden, give you extra strength and vitality! He is true! He has promised! He will do it, if you allow Him to. Pray in the morning and the evening! Worship Him with a life of obedience to Him! Pray with your Bible open and let Him speak to you through it. The Bible is trustworthy and so is the God who gave it! G’day! Welcome to Partake and our continuing series “Scriptural Delights!” Here is our twentieth podcast going through the tapestry of wonder that is Psalm 119! Today we look at the eighteenth of its twenty-two letters, Tsadhe, and its verses 137 to 144. Thanks for reading, KD! – that was fabulous! The study tonight was written and recorded by my mentor and friend, Jim Harris. This is his 4th and last of his contribution to this series. Over to you, Jim! Hello, and welcome to another study in Psalm 119. It covers verses 137-144 and each line in the Hebrew text starts with the letter ‘TSADHE’. The very first word in the NIV translation introduces the dominant theme in this stanza. It’s about God and things being ‘right’ or ‘righteous’. Cast your eyes over verses 137, 138, 142 and 144. Then, looking at them more closely, we get to see something like this. v137. God is righteous. ‘Righteous are you, O Lord. This may be understood in terms of God’s relationship with his people. He keeps his promises. He provides for their needs. He is faithful in all his deeds and ways. He always does what is right, for God cannot deny himself; God cannot lie; God cannot break his word, once given. Verse 140 reads, ‘Your promises have been thoroughly tested, and your servant loves them.’ God is righteous. He’s consistent. If that is true, then what flows from God is also righteous. Verse 137 again, ‘You are righteous, O Lord, and your laws are right.’ God gave his Law through Moses. The detailed laws within it were designed to shape the crowd of people who escaped from slavery in Egypt, into a coherent nation fit to live in the Promised Land, where they would show the rest of the world what the LORD was really like. At least, that was the intention, but its working out fell short of God’s wishes, because his people were not altogether co-operative. v138 has a similarly high view of God’s statutes – another word describing the detail of God’s Law. ‘The statutes you have laid down are righteous; they are fully trustworthy.’ They flow from God, therefore they are as dependable and effective as God himself is. If God said it, then you can rely on it. So, that is the thrust of this passage for those of us who have committed our lives to Christ and are listed among his people. We have the word of God to a much greater extent than the psalmist did, in that we have both Old and New Testaments. If we don’t have an appetite to read and hear it, ask the Holy Spirit to make us hungry for it. If our lives are being shaped mostly by influences drawn from this world in which we live, let’s open ourselves up to the Lord through Scripture, and ask the Holy Spirit to use it to make us more like the Lord himself, to whom we owe everything spiritually. If our reading of life’s negative experiences causes us to doubt the goodness and love of God, let’s soak our minds in the glorious truth of a passage like Romans chapter 8. If we have doubts about our salvation let’s give ourselves, this Easter, to reading in the Gospels the four accounts of Jesus death and resurrection. And so the list could go on, but it’s time to close. I leave you with one of Scripture’s famous 3:16s – Colossians 3:16, ‘Let the word of Christ dwell in you richly.’ The Lord be with you. G’day! 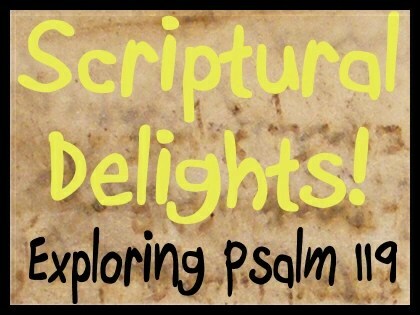 Welcome to Partake and our continuing series “Scriptural Delights!” going through the wonder that is Psalm 119! Here is our nineteenth podcast of the series! Today we look at the seventeenth of its twenty-two letters, Pe, and its verses 129 to 136. The bible reading is done by Sharona. Thanks Sharona! The study tonight was written and recorded by my mentor and friend, Jim Harris. This is 3rd in this series and he has one more to do. Greetings! This study in the section associated with the Hebrew letter ‘PE’ makes us consider the role of the word of God in bringing understanding to our minds, moral and spiritual direction to our lives, and heart satisfaction in our relationship with the Lord. To ease us into this, we look elsewhere in Scripture first. In Numbers 6:24-26, we read of the Aaronic Blessing. As the High Priest of the people of Israel, Aaron was instructed to bless them in the Name of the Lord. It’s my feeling that this priestly blessing was in the psalmist’s mind when he wrote this stanza, PE. ‘Turn to me and be gracious to me’ (132). The NIV reads ‘have mercy on me.’ Older translations use ‘be gracious’ but it amounts to the same, as both words imply acceptance, forgiveness and peace with God. Then, in verse 135, he says, ‘Make your face shine upon your servant’. So, asking God to turn towards him, to be gracious to him, to make his face shine upon him? I’m sure you can see the connection between this Psalm and that Blessing. How is the Christian equivalent of that blessing conferred upon us today? It’s done by the Holy Spirit through the word of God, the words of Scripture. Many church services include or conclude with these very words of Scripture, spoken as a ‘benediction’ or ‘announcement of blessing from the Lord’ upon his people. It also happens in our personal lives. As we read, believe, and respond to the wonderful words of God, we receive a rich blessing upon ourselves. The very first verse picks this up, ‘Your statutes are wonderful; therefore I obey them.’ The last verse takes a different but related line, ‘Streams of tears flow from my eyes, for your law is not obeyed.’ Here’s a man who really does understand the way in which the Lord confers his blessing upon his believing people, and grieves that there are those who profess to belong to the Lord but refuse to obey his word. Let’s make sure that isn’t true of any of us! Now let’s see how God’s word brings his blessing, as we explore these verses. It begins by bringing understanding. Verse 130, ‘The unfolding of you words gives light; it gives understanding to the simple.’ By ‘simple’ he is not describing those with what we would call ‘learning difficulties’, but those whose understanding has not yet matured enough for them to be fully aware of God’s will and ways. Where there’s a willingness to learn about spiritual matters, the word of God will bring what the psalmist calls ‘light’. This is a process which combines insight and wisdom. We gain further insight into the Lord and his ways with humankind; into the realm of spiritual realities and experience; into the whole meaning of Jesus and his work of redemption; into what it means to live by the Spirit, and so on. We also receive the gift of wisdom, which enables us to apply what we know through insight to our lives in this world. That way we can live to the praise and glory of God. Finally, Scripture also enables us to enjoy heart-satisfaction in our relationship with the Lord. In verse 131 he is ‘longing for (the Lord’s) commands’ and describes himself ‘panting’ like a thirsty animal. In 134 he wishes to be free from the force of human opinions and pressure, so that he can respond fully to the Lord. In 135 he is looking for a shining sense of God’s presence, as he responds to what the Lord shows him in his word. This is the language of a truly devotional life; a servant of God who wants to walk closely with the Lord and to enjoy his presence.